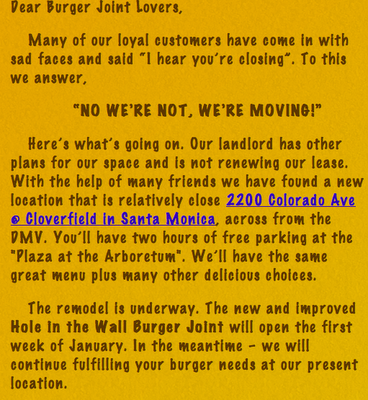 Contrary to a myriad of online reports, Hole in the Wall Burger Joint, is not moving to Santa Monica's Third Street Promenade after all. Rather, the West L.A. home to some of LA's best beef and turkey burgers plans to relocate to another Santa Monica spot - 2200 Colorado Avenue. The new location will open the first week of January. Fret not, Westside burger aficionados, the current location will continue to sling burgers until then. And while many may view the new location as a bit random and less than ideal, I would argue the contrary. The Yahoo/MTV/DMV area is crawling with lunch goers during the week and the weekends appear primed to be fruitful in the near future with the ongoing Metro construction nearby. Also major freaking bonus: the new Hole in the Wall will come with free two hour parking (parking was a major problem at the original location). Furthermore, the sparkly new Colorado Ave location will expand the HitW menu to include sandwiches, desserts and more sides. The West Hollywood location will remain at its current stomping grounds. The new location makes perfect sense. Aside from the places you mentioned, there are also the offices in the Water Garden. Plus, not much competition from other restaurants, though you do have the food trucks to contend with. Bummed they're closing the WLA location, though. They're right by me, and I've never had trouble finding parking on Bentley.